Welcome to my 120th trip report! I fly quite frequently but this is my very first redemption return ticket, using Delta Skymiles. This experience is new to me but let me share this to those who wish to do the same. Flying to Busan came into my mind a few times and I knew that I had to make the trip there this time and stay for at least a few nights to discover more about this city since most of the time, Seoul has been the most common topic among Korean travel, so why not fly to another bustling city to discover more about this beautiful country. Checking my milage points on Delta Skymiles, I decided to redeem them. One big advantage of using this airline's program miles is they don't expire. I was previously using Northwest miles and was transferred to Delta when this airline took over NW and thankfully the miles stayed. The Delta staff helped me do the redemption told me the only way to select seat was to call the Korean Air to do it and she could only send in a request. Not true, I used the Delta's mobile app and was able to choose my seat. As for check-in, I used Korean Air's app to do so, no issue at all. 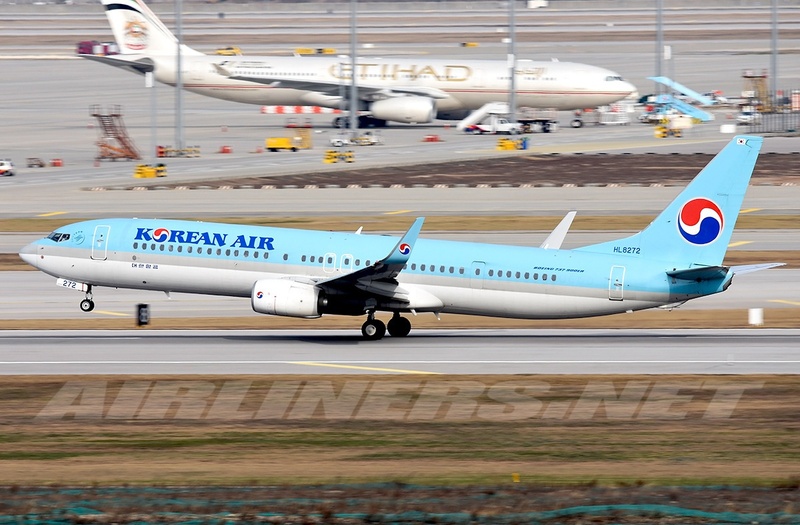 Check out my part 2 - My return flight and also insight of Busan and the Airport! Hope you find the information useful. First, check out the flights you want to fly on, make sure the airline's program you are using is a partner with the airline that you are flying on. For example: You are using Finnair's mileage program and wish to fly on a Cathay Pacific flight, that's possible because both airlines are in the same alliance, OneWorld. You have to call the airline's local number and give the membership number to the Customer Service Officer and she/he would help you check on those flights and the dates you request for. It all depends on Cathay Pacific for this case, if this airline has seats, you can redeem your miles otherwise you have to look at other options. Make sure you have enough miles to redeem them and be expected to pay for airport tax which doesn't cost a lot. With enough miles, not only can you redeem a return flight ticket, you can also upgrade yourself to a higher class, depends on availability. For my case, it went very smoothly and got my booking done within 15 minutes. I used Delta application (IOS) to check my booking. I suppose the other unavailable seats are for Korean Air passengers. Boeing 737-900ER? That's not true, the 739ER doesn't operate on domestic route, it should be listed as 737-900. My itinerary was confirmed. I had to pay 10000 miles + $10 tax for it. I have to compliment Delta Airlines for releasing an user-friendly application as I found it to be very easy to use. I got to enjoy some fine Korean dessert and local food. Cold Beef Soup at a popular restaurant, its pretty good. This is Chocolate dessert from Cacao Green located at Myeongdong. This has to be my favourite Korean local dish so far, its Beef Cold Noodles with appetizers and a cup of soup! 10,000 Won but its worth it. I took the Arex train from Seoul Station to Gimpo, this route has become a routine for me. Reaching there in less than 20 minutes, I made my way to the Korean Air Check-in counter. The staff couldn't find my booking initially but after giving her the 6 digit code PNR, problem solved and I got my boarding pass. Checking in here and there was quite a number of passengers, however the check-in staff were fast and it took around less than 10 minutes before my turn. I checked in the day before and chose 53F, but somehow when I saw my boarding pass, it was 33A. I asked the staff is it possible to change my seat to 52F instead and she did it. I found it to be strange why my seat was changed. My first flight to Busan, a different destination for a change. My domestic flights with these airlines, only short of Asiana. The one of the right belongs to T'way. Once that was done, I went to have lunch at a nearby cafeteria. Absolutely delicious, after that I went off to do some plane spotting. Korean Air Skyteam Boeing 777-200ER was heading to Jeju that afternoon. Jin Air's sole Boeing 777-200ER just arrived from Jeju. I was told that this gate that I was flying from was dedicated to Korean Air's Busan route. I was happy that the scheduled aircraft was still the Boeing 737-900 as published on the website, there are times aircraft equipment can change as some airline such as Cathay Pacific and Thai Airways are very good at doing last minute equipment changes and that can be frustrating for aviation enthusiasts like myself. Once boarding was called, I made my way down the aero-bridge. It turned out to be quite empty at the last few rows. Originally, I chose the seat in front of the wing, but I decided to sit near the rear so that I could see how long this -900 is. Greeted by the gracious and pretty Korean ladies and a male crew (first one for me) on this aircraft and I made my way to my seat, great news is I had the whole row for myself. 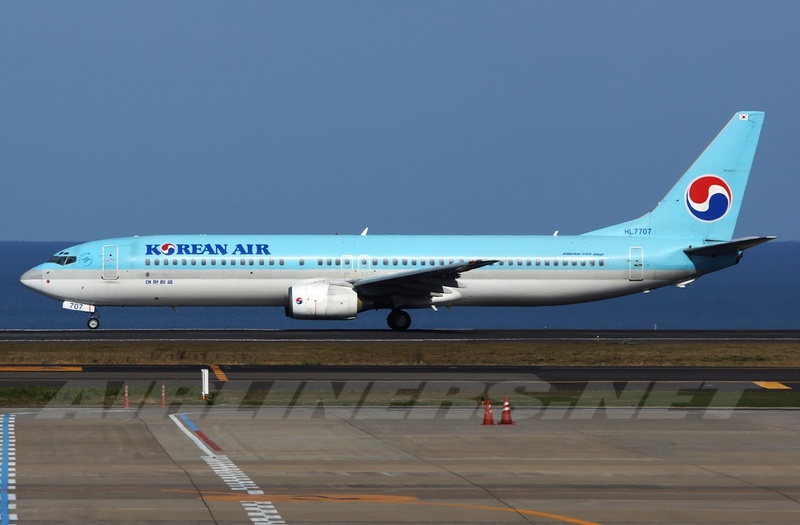 Entering Korean Air's narrow-body and on board the Boeing 737-900 (Non-ER) for my first time! Passing by Business Class, I could have redeemed miles for this section, just 1000 miles more but I chose not to since its such a short flight. I always prefer the 2-2 J class cabin on a narrow-body than 3-3 (middle seat block out for J class) , this is more of a business class. AVOD of short flights is not needed. 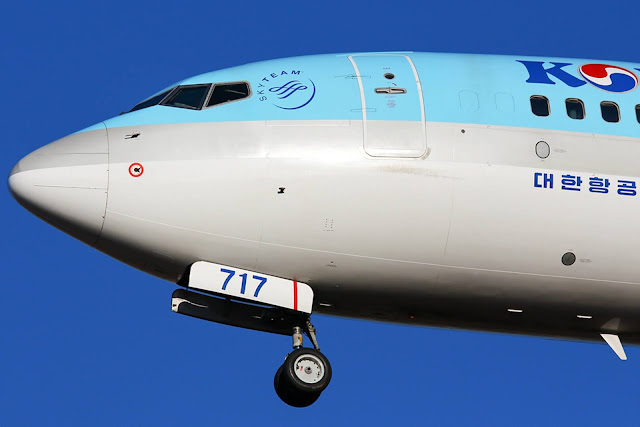 This aircraft flies not only only domestic routes, it also flies on regional routes to China and Japan, but the flight duration is less than 3 hours so no IFE system is installed on the 737-800 and 900 (Non-ERs). 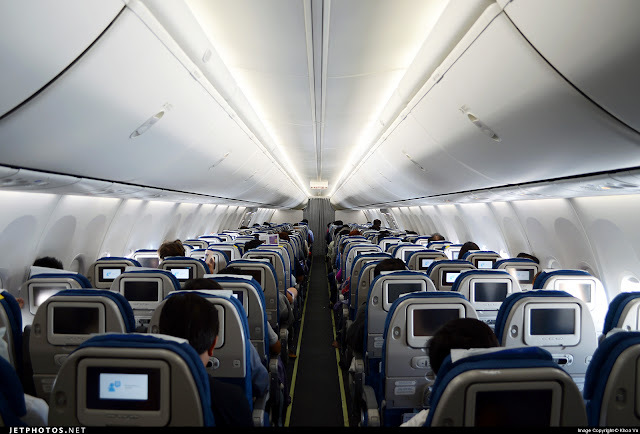 The Boeing 737-900ER flies on international routes and it is the only type to have IFE installed on every seat and the Boeing Sky Interior as they are newer. It looks quite comfortable for short hops. The mixture of blue and brown seats is quite nice, this aircraft features the old Y class products without IFE system but its not too bad. The difference between this aircraft and the -900ER is that this aircraft has 2 overwing emergency windows and 4 doors while the -900ER has this 2 overwing emergency windows with 6 doors. Can you spot the difference between both aircraft? The Korean Air crew were always there to help whichever passenger needed assistance. This was my seat, seat pitch was pretty tight, but bearable for the short hop. The seat pocket is filled with magazines which take up quite a bit of space in the seat pocket, reducing the legroom space as a result. Luckily, I had the other 2 seats empty. The drop-down screen was used on this short hop, got to enjoy the in-flight map for a short while. The audio remote control which is used on regional routes, with the drop-down screen in used. The weather didn't look good at Seoul, I thought it would be a routine flight to Busan with a bit of turbulence along the way, and also the flight time was just a short 40 minutes, but it felt like eternity! Read on to find out why. Aircraft was pushed back on time and we taxied to the threshold and waited for clearance for departure. Once a couple of aircraft landed, we hold short at the runway briefly before taking off. The take-off was powerful and we went through some minor bumps before finally cruising in smooth air but that lasted 10 minutes or so. The selt beat sign was turned off, the crew were in action and soon drink service came and I chose the drink. They had to do it fast since it was a short flight. Very happy to be on board a Korean Air flight, I was definitely well taken care of by the Korean crew. Even the male crew was also helpful and friendly. Mid-way through the flight, we had a few bumps and seat belt sign was turned off not long before and because it got worse, it was turned on and wasn't turned off until end of the flight. It got even worse while descending and the poor crew struggled to walk through the aisle. I was surprised that the Captain didn't announce for the cabin crew to return to the seat as I felt it was quite bad at that point. Down and Up-drifts were felt and one female crew had to seat down at my row for a short while before continuing her way to her seat at the rear. The turbulence reminded me of my flight from Seoul to Osaka with Peach Aviation but it wasn't as bad as the ride improved once we got out of the cloud. For my Peach flight, it was turbulent all the way from the flying part over Japan to landing and that was no joke. Luckily for us, the approach and landing was smooth and we were glad to be on the ground. The announcements on board the flight were done in both Korean and English and the Captain came on the speaker to welcome us on board and gave us some update on our flight progress, but he didn't mention anything about how bumpy it would get during descending. 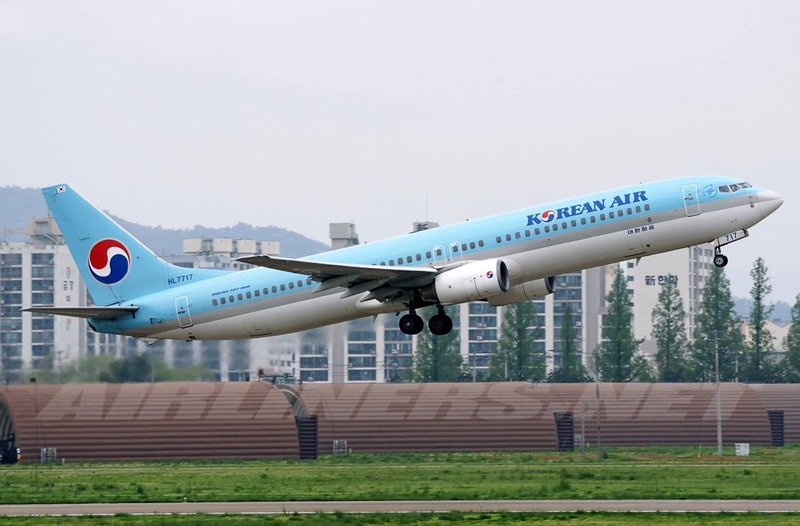 Do take note when landing or departing from Busan Airport. Don't take photos of Busan Airport (exterior) especially with the military airport beside it. Here are some window shot photos of the take off and mid-flight. My aircraft was parked beside Skyteam Boeing 777-200ER, on the same flight I flew on a few days ago, if only I knew! Jin Air's Boeing 777-200ER was here too, flying 4 times daily to Jeju. Off we went, departing from Hazy Seoul! A bit of bumps here and there. It was quite bumpy at this point, but our Boeing 737-900 handled it well with flying colours. I was wrong, we entered some more clouds and we got shaken quite a bit and it became quite violent that I held on to the front seat (vacant) and at the same time, a cabin crew needed support from the nearby seat. It lasted for a few minutes and finally we broke free from the unfriendly clouds. It was smoother at this point and my first glimpse of Busan emerged. Almost there and from this point, I had to stop taking photos, respecting the Korean regulation. We touched down smoothly and I guess other passengers may feel relief to be on the ground and as for the cabin crew, they had to fly this aircraft back to Seoul Gimpo, hopefully the ride back wasn't too rough. We taxied in the gloomy, rainy weather to our assigned gate and luckily for us, we were parked at the terminal where we disembarked via the aero-bridge. Flying through turbulence can be challenging for both passenger and cabin/flight crew. It was quite nerve-whacking for a period of time, but never in a moment on this flight I lost my composure but instead I looked back at my Peach flight's experience and compared which is worse and it did help me get my mind off. To see the cabin crew struggling to walk through the cabin, got me worried but fortunately no incident occurred and we landed safely. I felt that some lessons could be learnt over here, such as the flight crew giving warning about the bad weather ahead and also telling the cabin crew to take their seats. Cabin crew are trained to handle these kind of situation but they are human after all, they can crack under pressure. I have to give this seat of crew thumbs up as they didn't look nervous any point of time and even smile when the plane was shaking violently, no sign of nervousness at least from their expression. Well done!